Aspect Bathrooms is a family owned business specialising in bathroom alternations, creating en-suites and bathroom conversions. Established in 1987 by John Pinkett. Over the years Aspect Bathrooms reputation has grown and we our proud of our reputation. Read more about the history of Aspect Bathrooms. 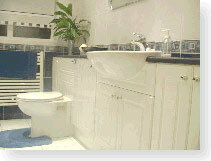 View images of bathroom renovations carried out by Aspect Bathrooms. I am very pleased with the finished result.